While bakeries and confectionaries may not be in short supply around Cairo, the execution of items like donuts, croissants and other assorted goodies is generally questionable. 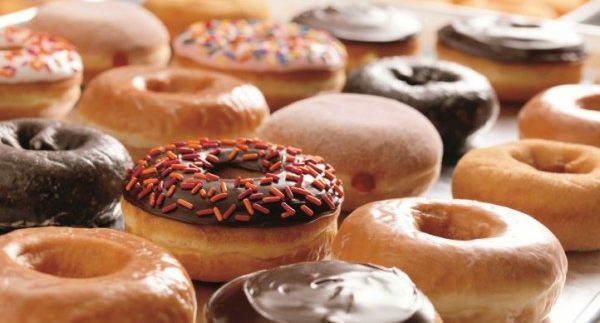 If you were to consider your options for a good donut right now, chances are you can only name a couple of venues because, unfortunately, the donut isn’t the most popular of sweets here. There’s not really much to a donut; you either have dough and icing, dough and a stuffing, or dough and glazing. That’s pretty much it. With such a big selection of donuts, cakes, rolls, cookies, brownies and muffins, we were honestly surprised when Big Bites emerged on Road 233 out of nowhere. Sporting a modestly-sized venue with a bright yellow colour scheme, a couple of wooden chairs and tables, and the display of goodies, the server will greet you as you step through the glass door, and pleasantly explain the flavours they have on offer. We opted for three stuffed donuts; a Blueberry and Cream Cheese (13LE), Apple and Cinnamon (13LE) and Strawberry Jam (13LE), as well as a Walnuts Brownie (12LE), a Cinnamon Roll (20LE) and a regular donut with White Chocolate and Caramel (10LE). Let's start of with the good; the Walnuts Brownie was quite tasty and surprisingly large, while the walnuts weren’t overpowering and created a good flavour mix with the chocolate. Unfortunately, however, the donuts were the biggest let down; while the stuffing was tasty all around, the dough itself tasted nothing like donuts, but instead closer to cake – and not fresh cake at that. But that wasn't even the biggest problem; a bigger issue was how sweet the whole thing was. By our third bite, all we could taste was sugar. The Cinnamon Roll, smothered in an obscure icing that neither tasted like cinnamon, nor complimented the cinnamon powder, had the same dough as the donuts, leaving the overall experience rather unfortunate. Maybe it was an off-night, maybe the goodies were indeed stale, but whatever the case, everything we ordered was so sweet it rendered our taste buds obsolete. Big Bites delivers; call 01017466622. Excellent brownie and generally a nice variation of donuts.